This year may well go down as the year of the comic book hero in movie history; there has been a whole host of them. Still, it was no surprise that, among them, one of the most hotly anticipated comic book hero movies of the year was The Dark Knight Rises (TDKR), the last in Christopher Nolan's Batman trilogy. Beginning in 2005 with Batman Begins and continuing with 2008's The Dark Knight, the fan base for Nolan's movies grew with each release. So it is maybe with a heavy heart that, with the release of The Dark Knight Rises to Blu-ray and DVD, we see the end of one of the most epic franchises the movie industry has produced in the last few years. Opening with the terrorist Bane (Tom Hardy, Inception, Warrior) escaping from his CIA guards in a highly imaginative and audacious plane hijacking, the story picks up eight years after The Dark Knight's conclusion. Bruce Wayne (Christian Bale) is a shadow of the man he formally was, a reclusive cripple who walks with the aid of a stick, broken physically and mentally from his years of crime fighting in the guise of The Batman. A guise that stood for a symbol of hope for many while regarded as a criminal vigilante by the few. Even when jewel thief Selina Kyle a.k.a. Catwoman (Anne Hathaway, Rachel Getting Married, The Devil Wears Prada) breaks in to Wayne Manor and gets caught red-handed by Wayne, you sense a reluctance on his part to confront her; it's going to take a lot more than this to get him back in the black suit. Back in the suit he does get, though, when he finds out that his old friend and only ally in the Gotham City Police Department, Commissioner Gordon (Gary Oldman), is lying on a hospital bed, barely alive, after escaping from the sewers where the new self-proclaimed leader of The League of Shadows has made his lair. I suppose you could not ask for a better hideout, what with the ability to move around Gotham undetected, searching for a nuclear renewable energy source he has found a way to convert into an atomic bomb and hold the city hostage. From here the movie starts to move at a faster pace, for if there was a criticism of this third outing of the Caped Crusader, it's that the first portion of the film was on the slow side. Nolan must have had sleepless nights trying to weave the intricacies of the story into such a short space of on screen time, and he must be applauded for doing such a good job, taking each thread and tying them together at the one point where chaos and order at last meet. While being drawn into the movie with each scene that passes, you realize that Bane and Wayne are not too different, but being born poles apart on the poverty line, their outlook on the world is totally different. The use of CGI for stunts and effects really can make or break a movie, and as with its predecessors, TDKR exploits it well, enhancing the screenplay and making you believe that what you are watching is reality. Whether there was any pressure from the studio to go down the all-too-familiar 3D route I don't know, but I for one am glad that route was not taken. A movie with great story and effects does not need any sort of conversion to enhance it. Another strong point in all the three movies is Hans Zimmer's soundtrack, a man at the top of his field and again failing to disappoint. TDKR's transfer is excellent; the colors on the Blu-ray are extremely vibrant, and just as with the release of The Dark Knight, the video ratio switches when the scenes are filmed in IMAX, to a breath-taking proportion. Second Screen Experience – Download the mobile/tablet app "The Dark Knight Rises FX" to enjoy exclusive content during the film. The Batmobile Documentary: Witness all five Batmobiles together for the first time in history. Dive deep into every aspect of the most awe-inspiring weapon in Batman's arsenal as you journey through the birth and evolution of this technological marvel and cultural icon. Ending the Knight: A comprehensive look into how Director Christopher Nolan and his production team made "The Dark Knight Rises" the epic conclusion to the Dark Knight legend. UltraViolet Copy – Hopefully they will be switching back to iTunes copy in 2013 since these copies are hopelessly useless and confusing to use. I could go on with the superlatives but the best compliment I could give is that I will be buying TDKR to sit upon the shelf next to the two other films in the trilogy. With its release just before Christmas, some may say the dark nature of Nolan's adaptation may be bad timing, but I say nonsense! I am sure many will be happy to find a copy in their stocking on Christmas morning. The Dark Knight Rises is released on Blu-ray, DVD and Digital Download from December 3rd in the United Kingdom and December 4th in the US. 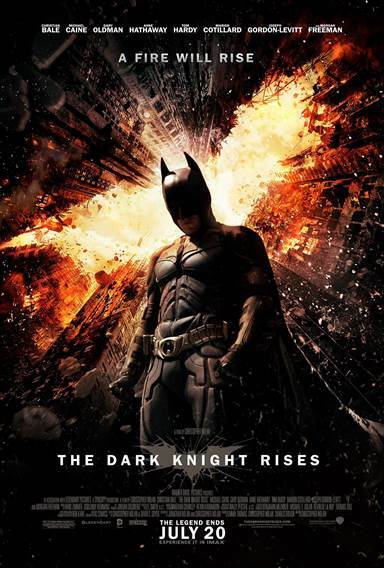 Download The Dark Knight Rises from the iTunes Store in Digial HD. For more information about The Dark Knight Rises visit the FlickDirect Movie Database.